Through its business consulting, information technology, and communications services, Mahindra Satyam provides tools that enable customers to achieve their business goals. This is accomplished by maintaining a team of professionals whose expertise covers many different arenas—business intelligence, business process quality, digital convergence, infrastructure management services, and operations, to name a few. The company matches the expertise to the clients’ needs for a quick and effective resolution. Clients range from small, private companies to Fortune 500 companies and span many different industries, including automotive, aviation, agriculture, finance, hospitality, information technology, real estate, and retail. Headquartered in India, the company maintains strategically located development and delivery centers around the world to better serve its global clients. Mahindra Satyam is part of the Mahindra Group, a global consortium of companies and one of the top 10 businesses based in India. 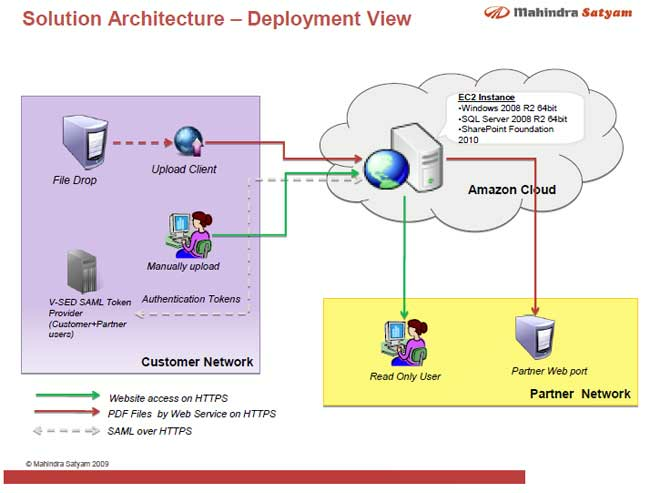 Mahindra Satyam approached Amazon Web Services (AWS) when one of its clients—a top 3 global pharmaceutical company—needed a way to share documents with its partners. In addition to document-sharing, the client needed the capability to search and download documents, integrate with Enterprise Systems to retrieve documents and metadata for upload, and authenticate all users against the Enterprise Active Directory. Microsoft SharePoint Portal is used as the document management portal for Enterprise users and partner users. Security Assertion Markup Language (SAML) authenticates claims against the Active Directory. Secure Sockets Layer (SSL) guarantees that data is securely transferred over the Internet. Amazon Elastic Compute Cloud (Amazon EC2) instances are launched in the public domain with Elastic IP and Domain Name Service (DNS). Windows Server 2008 and SQL Servers are used to configure the instances. Microsoft SharePoint Foundation 2010 configures the Customer SharePoint Site. Amazon Elastic Block Storage (Amazon EBS) will be added as needed for database storage and to meet growing data demand. As shown in the following diagram, the components of the above solution all work harmoniously to manage the varied tasks of the document management portal. 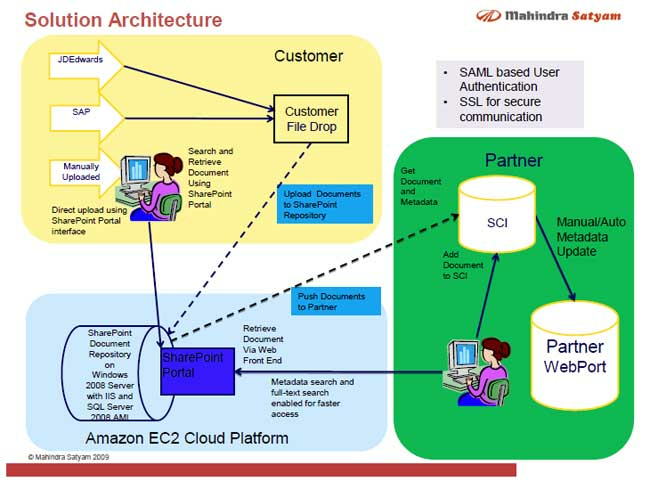 In searching for a cost-effective cloud architecture solution, Mahindra Satyam and its client were particularly drawn to several AWS features. The ability to scale up or down depending on traffic and the pay-per-use model were especially important, because these features reduce expenses by eliminating the cost of maintaining an infrastructure of physical servers. Another deciding factor was Amazon’s role in managing the services, which reduces the responsibilities (and headaches) as well as the costs of administering an infrastructure. Migrating to Amazon Web Services has proven to be a wise decision. Mahindra estimates that since incorporating the AWS solution, its pharmaceutical client has saved up to 40 percent in infrastructure and maintenance costs. There is also a significant reduction in up-front costs as well as the potential for reduced lifetime costs. Yes, Amazon Web Services definitely delivers. To learn more about deploying business applications in the AWS Cloud, visit our Business Applications detail page: http://aws.amazon.com/business-applications/.